Waikiki Beach wasn't as bad as I'd been told. In fact, it wasn't bad at all. In fact, it was gorgeous. I’ve been all over the map. First, in Honolulu, to celebrate my in-laws’ 50th wedding anniversary. We swam in the sea and (some of us) ate warm, salty, delicious Spam musubi. I understand why people resist, but once you try Spam musubi you will crave it forever. Then the big family party moved to Maui, where we swam in the sea and ate Costco food prepared in condo kitchens. My brother-in-law made a fresh pineapple pie so delicious that I must replicate it within the week. More on that coming soon. My kids and their five cousins . . . frolicked? Cavorted? Stupid words, but ones that begin to capture that combination of horseplay, confiding, pina colada-drinking (virgin, they said), snorkeling, card games, and utter nonsense that seven boisterous teenagers who have known each other since birth get up to when they’re reunited on a tropical island. Now. Cuties, all of them. 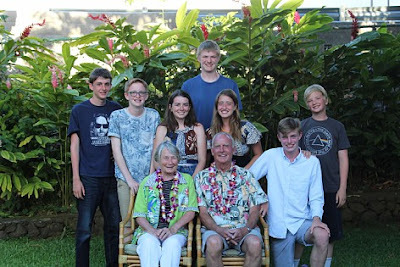 I had an ambitious eating list for Hawaii, but the trip was for celebrating David and Mary, not running around to bakeries and shave ice stands, so I was uncharacteristically at peace seeing gastronomic ambitions thwarted. It was a lovely, lovely trip even if I never got to try poi donuts. I am very grateful to have married into this warm, close family. 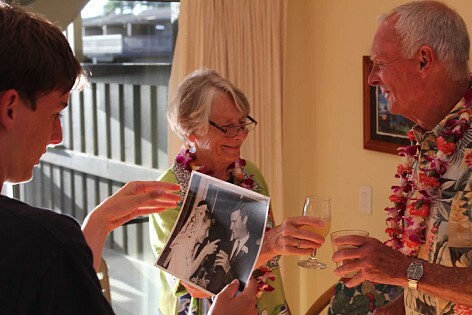 David and Mary were, and are, an adorable couple. I did come back with a fixation on purple sweet potato-haupia pie, a confection that a local person described to me and which I looked for everywhere and never found. I have to bake one if I’m ever going to taste one. So along with pineapple pie, that’s on the summer to-do list. The day after we got back from Maui, I flew to New England to install Owen at summer school. I swam in another sea and ate a couple of lobster rolls and stayed in my cousin’s house in the town of Rumford, Rhode Island, birthplace of Rumford baking powder, and got the kid all set up in his dorm with junk food and laundry detergent, only one of which will be put to use, and said good-bye for 6 weeks. I don’t remember Fonzie saying that and I’m not sure what that line even means. Is it dirty? In any case, the soup interested me. In addition to sugar snap peas, it contains onions, celery, garlic, brown sugar, and cashews, and it looked like it would be healthy, substantial, and easy. It was healthy, substantial, and easy. What it wasn’t, was good. The first bite was tasty, the second bite was less tasty, and a whole bowl was almost vomitous. I ended up throwing away the rest of the pot, and it was a big pot. Way too sweet! Sugar snap peas are already pretty sweet, so why the sugar? And in combination with the sweet, unctuous cashews -- blecch. Imagine a hot, sweet, green, liquidy pudding. Then I remembered that Headley’s book, Fancy Desserts, which won the 2015 Piglet, was packed with vegetable desserts, including a pea cake. He clearly isn’t as uptight about sweet-savory boundaries as I am. I also remembered that the cashew gelato from Fancy Desserts was glossy and divine, so if you have a copy of Fancy Desserts (and dextrose powder), you should make it. I looked for the recipe online and never found it, I’m sorry, but I did come across this 2012 story about ice cream that mentioned an innovative banana split at the Ice Cream Bar in San Francisco, a place I’d never even heard of. I was horrified. I pride myself on keeping track of bakeries, ice cream shops, and clever restaurants in my region. Big fail. The Ice Cream Bar. Something else for the summer to-do list. I have been trying to grow hydrangeas for years and was on the point of giving up. For next summer's to-do list: blue hydrangeas. You're back! As always, you were missed, but I'm glad you were having such a great time. Is your nest completely empty? If so, time to get up to all those things you can't when the nest isn't empty. Sounds like an opportunity! I haven't heard of any of those things you talked about cooking in your post. Sweet potato pie is a staple here in the South, so I wonder what the difference is with purple sweet potatoes? I think sweet potato pie is actually better than pumpkin. Fresh pineapple pie doesn't compute. Isn't it excessively runny? Can't wait for your next post! I found purple sweet potatoes which was step 1 in making this pie, so I will tell you everything once I've actually baked it. I agree with you about pineapple pie in theory, but this was one of those cool pies where the fruit is barely cooked, very juicy and fresh. I have the recipe now. Too many pies on my mind right now. For what it's worth, I don't think Fonzie would say that either--doesn't pass the cool test, to me at least. No, and it just sounded dirty for 1970s TV. I had the banana split at Ice Cream Bar last night! Sooooooo good.T hey flambé the banana with a little blowtorch. All the ice cream and sauces (ex. cherry) are homemade. Tim. We went there two nights ago -- I wanted the banana split but we were too full from dinner to do that so I had the devil dog ice cream with marshmallow. That place is great! Not just another organic/ironic ice cream store. Now I have to back for the banana split. Homemade maraschino cherry? Yum. Welcome home! Your trip sounds delightful. Having been to Waikiki I can confirm that despite the immense scorn heaped on it by, well, snobs, it is actually beautiful and a great vacation spot. The soup sounds revolting just given the list of ingredients. I could go for Spam musubi, though. Yeah, I thought Waikiki was going to be a pit, but it was so pretty and very clean. Great people watching, too. Love the group photos. nice family. I was on Waikiki beach in the mid 80's and was spoiled forever by the incredible beauty of the beaches! Too bad I didn't know about spam musubi back then, I'm sure I would have loved it! 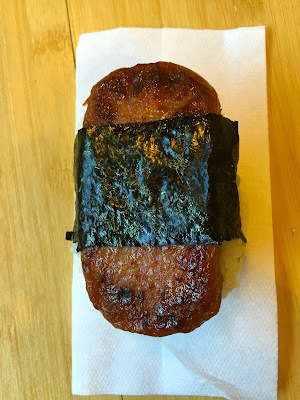 I didn't know about spam musubi until a commenter on this blog mentioned it at some point. I was so against it in principle, but when I tried it I fell for it immediately. Paul Prudhomme's sweet potato pie...and soup sounds gruesome! Paul Prudhomme! I haven't heard that name in a while. I should pull out those books. I'd about given up. Hoping you will be driven to post non-stop!! love your writing. We had too much Spam growing up so I can not wrap my arms around spam anything! Is that the same hydrangea that was there when you bought the house? Looks beauty. 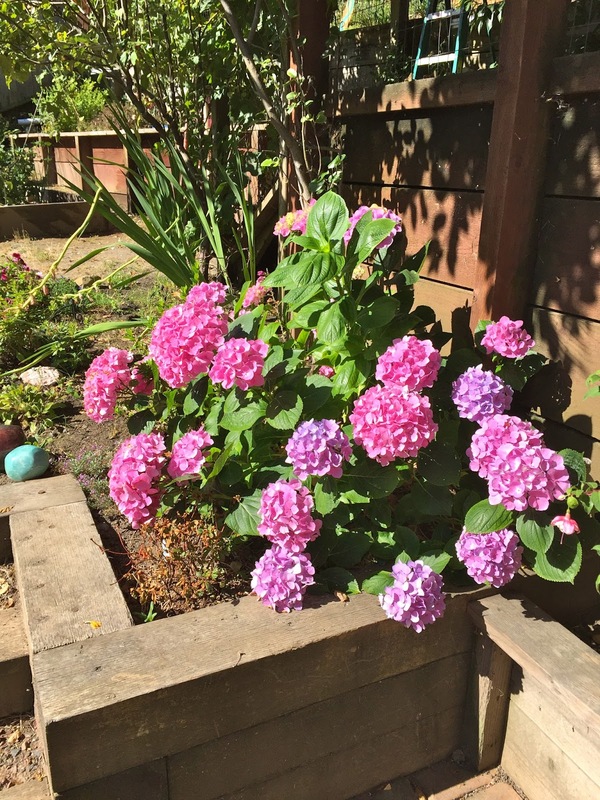 Was there a hydrangea when we bought the house? I don't remember that, but it's probably yet another wonderful plant that I somehow inadvertently killed in those early days. The apple tree, at least, lives on, as do the unsinkable red camellias. Bottle brush had to go last year. That was sad. I loved that bottle brush even though no one else did. I almost made that pea and cashew soup recipe. Thanks for saving me the time and ingredients! It's lovely how you appreciate your family so much.